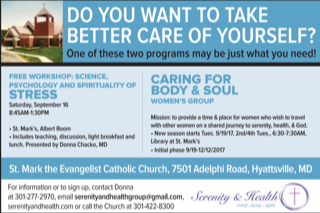 Serenity and Health offers continuing events, one-day workshops, and additional support to groups in the Washington, D.C.-metro area. * All programs are created and led by Donna Chacko, M.D., and provide a remarkable opportunity for those who wish to improve the health of their body, mind, and spirit. This open women’s group was established in early 2016 to provide a time and place for women to support one another on their shared journey to serenity, health, and God. We meet twice monthly, at 6:30 A.M., at St. Mark the Evangelist Catholic Church in Hyattsville, MD. "YOUR PATH," is a concentrated 6 to 8-week program designed for individuals who suffer and want to feel better and even transform their lives. If you suffer from chronic illness, pain, obesity, stress or anxiety, and are willing to make a commitment to follow a new and better path, this is for you. This program takes place in Hyattsville, MD. Next program planned for fall 2019 (dates to be determined). Plus, we are hoping to offer it online in the near future! Contact Serenity and Health and we’ll keep you posted when a new in-person or online session is planned. Church groups, schools, nonprofit organizations, or any group with a shared interest in learning how to enhance health, serenity, and intimacy with God will benefit! Stressed? How God Can Help You Help Yourself. Presentation, discussion, and small groups dealing with the science, psychology, and spirituality of stress and what this means in daily life. A one-day workshop on understanding and practicing mindfulness from a spiritual perspective. Discover how stress harms health and interferes with peace and closeness to God. What Does God Have to Do With Your Health? If you are interested in having Donna speak at your venue or facilitate a workshop, she will be happy to discuss the topics listed above or themes covered in her blog. To get started, please complete and submit the contact form. *Please note that in-person workshops mostly occur in the Washington, D.C.-metro area. Locations outside the area may be considered.